On this page ... J. Crown & Sons, Davison & Stokoe, John Denniston, page bottom (donkeys). Corrections in any of the material which follows, however tiny, would be most welcome. And additions, of course! (57 + 2 = 59) Test. J. CROWN & SONS LTD.
First a few images. Just one, however, at this moment. Hover your mouse over each thumbnail to read the subject matter. Can you help with the history of this company? I have read however that 'John Crown & Sons' was founded in 1847. It is clear however that that date was not, by a long shot, the beginning. 'Where Ships Are Born', devotes a few paragraphs to 'Crown' history & indicates that tradition tells of a 'Crown' involved in the Sunderland shipping business as early as 1761. The first 'Crown' for which there are authentic records is, apparently, Luke Crown who commenced business on his own account in 1807 having served his apprenticeship at Henry Rudd of Monkwearmouth & Pallion between the years 1790 & 1800. There was also a James Crown in the early years of the 19th century. So the John Crown who commenced business in 1847 was of a much later generation. He took over the yard located at the Strand Slipway, Monkwearmouth, which yard had previously been occupied by John Candlish. The business had a number of names over the years, including, I am advised, 'The Strand Slipway Co.'. The use of that name would seem to have commenced in 1872. The company was often, it would seem, referred to as 'Strand Shipbuilding Company' as per these newspaper cuttings provided (thanks!) by Lyndon Pritchard. It reverted to a 'John Crown name' in 1900 but became 'John Crown & Sons Ltd.' in 1903. At the end of WW2, the yard had a 225 ft. slipway & a graving dock of 400 ft. It was taken over in 1946 by Joseph L. Thompson & Sons Ltd., but it continued to operate as a separate yard until it was closed in 1958. I thank 'Tyne & Wear Archives' also for a portion of that data which is available on page 14 of this 'pdf' file. In or about 1893, Luke Crown, a shipwright, born in Monkwearmouth in about 1839, wrote 'Reflections of Southwick', a manuscript which covers the early shipbuilding history of Southwick. You can read about the manuscript & access its text via this page. It was known to the shipyard workers as 'Crone' rather than 'Crown', I am told. Names of just a few of the vessels constructed by 'Crown' of Sunderland - as I happen to spot references to them. In a table in build date sequence. And in alpha sequence within a year. I am advised that Silverisle was the final vessel built at the 'Crown' yard, Hull # 243. That may well prove to be so, however the highest 'Crown' Hull # recorded at the fine New Zealand site 'Miramar', is #249 (Flying Wizard). And by launch date Miramar indicates Silverweir, Hull #245, to be the final launch - on Mar. 16, 1961. Now see the partial build list on page 151. I am just the scribe! I was not there! Has anybody seen a complete built list? A partial list in on site page 142. I list just 57 'Crown' vessels below. A long long way to go! Note that I do not list on this page the vessels built at the 'Crown' yard, after Joseph L. Thompson & Sons Ltd. acquired the yard in 1946. Any such vessels will be covered as 'Thompson' ships here. 239 vessels built before that ownership change. And 10 after it. Built by Jas. Crown. A 3 masted barque. Per 1 (1881 Inquiry report, 'Severn and Mayumba'). There are many references to the 'bark' in the registers at Mystic Seaport. 128.5 ft. long, signal letters HTJN. Built for 'R. Gayner' of Sunderland, which means Robert H. Gayner (the H. means Haydon) & others. Owned, as to 48/64 by Robert H. Gayner. And as to 16/64 by F. Fisher, maybe H. F. Fisher. On Jan. 30, 1881, 100 miles N. of Madiera, (a Portuguese archipelago, in the N. Atlantic, W. of Morocco) Severn, Isaac H. Rutherford in command, with a cargo of coal, was in collision with Mayumba, a 991 ton steamer owned by African Steamship Company, with passengers & cargo, en route from Madiera to Liverpool. Severn sank. There was loss of life. How many? At the Liverpool Inquiry, the 2nd mate of Mayumba, Charles P. Clarke, was found to be responsible for failing to keep a proper look-out. His certificate was suspended for 6 months. WWW data is limited. Is it possible that you can provide more? An image? A 3 masted barque. Per 1 (extensive account of the 1886 wreck, ex 2), 3 (vessel & wreck data), 4 (wreck enquiry results), 5 & 6 (other contemporary reports, incl. crew names, but there are many more reports available). 159.0 ft. long, signal letters RBNL, launched in Sep. 1877. The very last wooden ship built by 'Crown'. The vessel is not Miramar listed. South Milton? A small village in Devon, close to both Salcombe & Kingsbridge. The webmaster has a number of editions of Lloyd's Register available to him from 'Google' books, see left. The vessel was built for B. Balkwill & Co. of Salcombe, Devon, U.K., who remained the vessel's recorded owners thru the 1885/86 register, in which the vessel is reported as being 'lost'. In 1886, & likely from 1877, the vessel was owned via a 20 share partnership. I presume that B. Balkwill was the major shareholder & the ship's managing owner. A 'Balkwill fleet (was) largely engaged in trade with ports in Iberia, the Mediterranean, Azores, West Indies, etc.' However, this vessel clearly spent much of its life in Australian waters. W. Friend, who was the vessel's first master, died aboard the ship. On Mar. 7, 1886, South Milton left Port Louis, Mauritius, for Melbourne, Victoria, Australia, with Captain H. (Henry) Trinnick in command & 17 aboard all told including the Captain's 12 year old son. She carried 800 (or 840) tons of sugar, valued at �20,000 (or �22,000). In the early hours of Apl. 12, 1886, the vessel, under full sail, approached Barwon Heads, near Port Phillip Heads, on the approaches to Melbourne. At 4 a.m., under smooth but hazy conditions, the vessel struck Charlemont Reef (or better Limeburner's Reef) - indeed she struck it twice. The vessel's bottom boards were smashed in, the ship filled with water & settled by the bow. Fortunately she swung off the reef into calmer water, so the crew were able to take to two ship's boats. They were picked up by Rip, a pilot schooner, & landed at Queenscliff. It would seem that Rip had been approaching South Milton, to place a pilot aboard her. Tugs Avon & Albatross were sent to render assistance but there was nothing for them to do - the ship had broken up & had disappeared under the surface, in 9 fathoms of water, just 20 (or maybe 30) minutes after she had struck the reef. No lives were lost. However the Captain's Newfoundland dog (need image!) did lose its life when air compressed within the ship caused the quarter deck to explode. A State of Victoria Steam Navigation Board Inquiry was held into the wreck. Captain Trinnick was found guilty of careless navigation, & his Board of Trade master's certificate was suspended for 3 months. Apparently the lookout man, John H. Trinnick, a carpenter, & the Captain's nephew, had seen land 10 minutes before she struck & told nobody. Had he spoken, the wreck likely would never have happened. You can read the reasons for the Board's decision at 4. The wreck & its cargo was sold at auction on Apl. 15, 1886 - the wreck sold for �12 while the cargo sold for 11 shillings. I have read that what is left of the wreck is still there today, at 38.30.2167S/ 144.48.433E. Is it possible that you can provide more? An image? An iron cargo ship. Per 1 (3rd item in 'The Record 1885'), 2 (Miramar, link, you now must be registered to access). 260.0 ft. long, signal letters HFJR. Per 1, rig 'Scw � B', but so far I have not spotted, at 'Mystic Seaport', the meaning of that abbreviation. But 'Scw' at Lloyd's means 'screw'. The webmaster has a few editions of Lloyd's Registers available to him, thru 1889/90, see left. Built for Peacock Bros., maybe 'Peacock Bros. & Sons', merchants, of Sunderland. Surveyed at Baltimore, U.S.A., in 1885. By the 1887/88 edition of Lloyd's, the vessel was owned by 'Thompson & Brown' of Sunderland. Were there later ownership changes? I don't know the answer yet, but it would seem that there were no later changes of vessel name. On Dec. 1, 1910, the vessel was involved in a collision at Scharh�rn, Elbe, Germany (an island 17 1/2 km. NW of Cuxhaven). And presumably was lost. WWW data is most limited. Is it possible that you can provide more data about the 1910 collision. Or anything else, in fact, including an image? A cargo ship launched in Aug. 1886. Per 1 (details re wreck), 2 (Russian page), 3 (link 2 translated), 4 (Russian page), 5 (link 4 translated), 6 (Miramar, link, you now must be registered to access). 228.1 ft. long, signal letters HQVF, 119 HP. The webmaster has a few editions of Lloyd's Registers available to him, thru 1889/90, see left. Constructed for 'Fenwick & Co.', of London. I read that in 1891, the vessel was sold to 'S Tourcoul', renamed Ignatiy Prokhorov & registered at Odessa. Lloyd's Register ('LR') of 1897/98 lists S. Tourcoul rather as the owner of Ignatius Prohoroff. It was sold again, in 1903, to 'S. l. Karapatnitskiy' (Beware! That is a WWW translation of 'С. Л. Карапатницкий', the Russian text, & probably is imperfect). The vessel became recorded at 1369 tons. LR of 1911/12 again lists Ignatius Prohoroff, of 1369 tons, owned by Sch. & E. Karapatnitsky & registered at Odessa. The vessel was requisitioned by the Russian? Navy (Transport #27) - cannot understand what is stated as its purpose - & in 1917 by the 'White Guards' who operated in the Black Sea area. In Nov. 1918, the vessel hit a mine & sank near Sevastopol, Ukraine. The wreck has been positively located, lying in 274 ft. of water, SW of Sevastopol, indeed an image is available of the brass engine plate as at left. The above is in part from the webmaster's attempt at a WWW translation of Russian texts. The name of the vessel may well have been 'Ignatii Prokhorov' (ИГНАТИЙ ПРОХОРОВ in Russian). Is it possible that you can correct any errors above and/or provide more data & an image? A cargo ship. Per 1 (wreck data, Glynymel), 2 ('uboat.net', Glynymel), 3 (Glynymel), 4 (12 March 1917), 5 (data, sinking), 6 (Miramar, link, you now must be registered to access). About 80 metres long. Constructed for 'Sociedad General Mallorquina de Palma', of Palma, Spain, & registered in Spain. The vessel was sold, in 1895 (or 1897), to 'Abchurch Steamship Co. Ltd. (Fenwick Stobart & Co. Ltd., the manager), of London perhaps, & renamed Abchurch. It was sold again, in 1898, to 'P. Regier', of Mariupol, Ukraine, & renamed Maria Regier. And sold again, in 1913, to Harries Bros & Co., of Swansea, Wales, & renamed Glynymel. On Mar. 12, 1917, while en route from Rouen (or Le Havre), France, to Swansea, in ballast, the vessel was shelled, captured, torpedoed & sunk (or sunk with scuttling charges) by UC-66, Oberleutnant zur See Herbert Pustkuchen in command, near St. Catherine's Point, Isle of Wight. 1 life was lost. The wreck is possibly at 50.12.5N/1.11.0W, S. of St. Catherine's Point, or maybe 15 or 23 miles SW of St. Catherines's Point. The wreck has not been located & the exact wreck site is therefore unknown. WWW data is most limited. Is it possible that you can provide more data and/or an image? A cargo ship. Per 1 (Miramar, link, you now must be registered to access). 302.3 ft. long. The sole Lloyd's Register listing, available to the webmaster, is at left. Built for Angier Shipping Co. Ltd., of London. The vessel was sold, in 1896, to 'Holzapfel Whitfield' & renamed Stowford. And sold again, in 1910, to 'A. Palios' & renamed Prometheus. And sold again, in 1912, to 'A. & G. Fratelli Sturlese' or maybe 'Sturlese Bros.', of Italy, & renamed Anteo. On Nov. 12, 1917, the vessel hit a mine & sank SSW of Leghorn in the Mediterranean. WWW data is most limited. Is it possible that you can provide more data and/or an image? A cargo ship. What a lot of owner & name changes! Per 1 ['pdf', Belgica (3), p.46, 20% down], 2 (1901 census document), 3 (Miramar, link, you now must be registered to access). 228.1 (or 220.1) ft. long, 64.5 metres, perpendicular to perpendicular. Constructed for Wearmouth Steamship Co. Ltd., of London. In Mar. 1901, the vessel was sold to William France, Fenwick & Co. Ltd., also of London. A site visitor has kindly provided an unusual 1901 census document (2), that indicates that, on Mar. 31, 1901, James Lumsden was the vessel's master & names many of the then crew. The vessel was sold, in Jul. 1903, to 'Soc. d'Armement Gantois', of Ghent, Belgium, & renamed Belgica. In Oct. 1907, the vessel was sold to 'Ghent Lloyd S.A.', also of Ghent. In Aug. 1914, the vessel was interned at Pillau, Russia. And sold, in May 1920, to 'Les Affr�teurs R�unis Belges', of Antwerp, Belgium, & renamed Gloria. In Jul. 1921, it was sold to Soc. "Les Affr�teurs R�unis", of Rouen, France, & renamed Mar�chal Lyautey. And sold, in 1926, to 'Giuseppe Mirabella', of Catania, Italy, & renamed Sara Minnola. Sold, yet again, in 1929, to 'Paolo de Gennaro', also of Catania & renamed Tosca. And sold again, in 1930, to 'L. Panunzio', of Molfetta, Italy. And in 1931 was sold back to 'Paolo de Gennaro', now also of Molfetta. In 1934, the vessel was sold to 'Giuseppe Parisi fu Giovanni', of Naples, Italy, & renamed Francesca R. And sold for the last time, in 1937, to 'Raffaele Romano', also of Naples, & renamed Fertilia. On Jan. 30, 1942, the vessel was hit by a torpedo fired by HMS Thunderbolt, 10 miles NE of Brindisi, Italy. Loss of life? But was that indeed so? Read the data at the bottom of the reference at 1, which implies that vessel may have survived until Nov. 23, 1942 - but the meaning of the words is unclear to me. I have not referred to manager names above, because the history is complicated enough already. WWW data is most limited & I am grateful for the above 2 links. Is it possible that you can correct any errors above and/or provide more data? An image? A collier that was launched on Jan. 16, 1904 & completed in Feb. 1904. Per 1 (sinking, Springhill), 2 ('uboat.net' sinking, Springhill), 3 ('wrecksite.eu', sinking data, Springhill), 4 (UB-21), 5 (Miramar, link, you now must be registered to access). 253.2 ft. long, 77.2 metres, perpendicular to perpendicular, speed of 9 knots, signal letters VPDS, 166 HP engines by North Eastern Marine Engineering Co. Ltd. of Sunderland. Built for 'The Porthcawl Steamship Co. Ltd.', of Cardiff, Wales, (Thomas, Stephens & Wilson, the managers). But not exactly! It would seem that the vessel was initially registered in the names of Thomas, Stephens & Wilson - for a wee period until Porthcawl their company had been set up. The vessel was transferred from the three individuals names into the company name on Feb. 4, 1904. We thank Stephen Rowson for that interesting history detail. The vessel was sold, in 1914, to Fisher Renwick & Co. ('Fisher'), of Newcastle, & renamed Springhill. It would seem, however, that the vessel was actually owned by 'Ella Sayer Steamship Co. Ltd.', a Fisher company, I presume. In late Aug. 1917, the vessel, en route from Hartlepool to London with a cargo of coal, was sunk. At 54.21N/00.22W, 4 miles off Scarborough. The data as to how the vessel sank differs. At 11.30 a.m. on Aug. 24, 1917, it either struck a mine laid by UB-21, Oberleutnant zur See Franz Walther in command, & sank. Or per a number of the above links, it was in fact torpedoed by UB-21. There were two explosions which resulted in a large hole in the hull & the vessel sank within 2 minutes. Of the crew of 20 all told, 5 lives were lost. 3 advises that most of the crew were picked up by Eden, (not sure which one), one man being picked up by the drifter White Rose & landed at Scarborough. But ... Tom Lewis advises (thanks Tom!) that his grandfather, Thomas Lewis, sailed on the ship when named both Porthcawl & Springhill. While it was his very first ship, he was not aboard for the final voyage in Aug. 1917. Tom states that the ship's crew agreement indicates that Springhill was in fact mined, with the loss of 4 men only, data 'which was subsequently confirmed by the owners'. The Captain, who survived, was Alex Gilbert who had taken over from Walter Williams. Can you provide more data? An image would be most welcome. A collier. Per 1 ('uboat.net', sinking, Presto), 2 ('wrecksite.eu', data, Presto & its wreck, with image - but I think that the image may rather be of Dunelm, later Presto, built 1916 by R. Thompson. Can anybody clarify the matter? ), 3 (Miramar, link, you now must be registered to access). 69.6 metres long perpendicular to perpendicular, 228.4 ft., speed of 8 1/2 or 9 1/2 knots. Built for Pelton Steamship Co. Ltd. ('Pelton'), owned by R. S. Gardiner & Joseph Reay, 'Gardiner & Reay', the managers, all of Newcastle. I am advised that Pelton owned coal mines & also owned a fleet of colliers trading to the Thames, S. coast ports & to the Baltic, sailing mostly from the Tyne, & returning from the Baltic with a deck cargo of sawn timber & pit props. On Apl. 6, 1917, the vessel was en route, in ballast, from London to Newcastle, Captain Lowery in command, with a crew of ? (can anybody advise?). At 9:40 a.m. that day, the vessel hit a German mine, when 4 miles E. of Roker Point, Sunderland. At 54.57N/01.16W. There was an explosion in No. 1 hold in which 4 (or maybe 6) crewmen were killed - might a Sunderland 1917 newspaper article resolve that issue. The survivors took to the boats from which they were rescued by the 'examination vessel' which took Presto in tow for the nearby coast. Two tugs arrived & assisted in the tow. The ship, which was taking on water, never made it to the shallows. It sank by the bow at 11:00 a.m., 1 1/2 miles off Roker lighthouse, in 17 metres of water. At 54.55.44N/01.19.02W maybe? The mine? It had been laid a few days earlier, on Apl. 03, 1917, by UC-40, Oberleutnant zur See Gustav Deuerlich in command. Is it possible that you can help with more data & perhaps an image? A cargo ship, mainly used as a collier, perhaps. Which had a long life & many names. Per 1 (Furness Withy, Tudhoe), 2 (data, Capitol), 3 (data, Vilma, 80% down), 4 (Miramar, link, you now must be registered to access). 70.1 metres perpendicular to perpendicular, 230.0 ft., speed of 9 knots. Constructed for British Maritime Trust Ltd., of London, with Furness Withy & Company Ltd. ('Furness'), of West Hartlepool, the managers. In 1907 Furness became the owners. The vessel was sold, in 1913, to 'J. P. J�nsson', of Landskrona, Sweden, & renamed Grovemont. On Feb. 23, 1915, the vessel was sold again, to (per Niels Hald-Andersen - thanks!) 'S.S. Finland (Albert Jensen), of Copenhagen, & renamed Finland, but was taken over by the British Government. She continued in operation with 'Gas Light & Coke Company' (which later became 'North Thames Gas Board'), as, renamed, Capitol. In 1925, the vessel was sold to 'K. S. Nordgreen', of Bergen, Norway, & renamed Vilma. Used as a collier, on the Svalbard (an archipelago, the most northerly part of Norway, located half way between mainland Norway & the North Pole) to North Norway route. The vessel was attacked by British aircraft, in Sognefjord, Norway, on Dec. 3, 1940, while carrying limestone from Fuaske, Norway, (correctly Fauske?) - the vessel was not hit by bombs but was damaged by machine gun fire - it was able to proceed to Knarrevik, Sweden (1 life was lost, the pilot). In 1947, the vessel was sold to 'H. Liljestrand', of Finland, & renamed Inga L. Was renamed Aira in 1954. In 1955, the vessel was sold for the last time, to 'W. Rostedt', also of Finland, & renamed Lisbet. The vessel was broken up at Hamburg, Germany, in Jul. 1957. Is it possible that you can help with more data & perhaps an image? 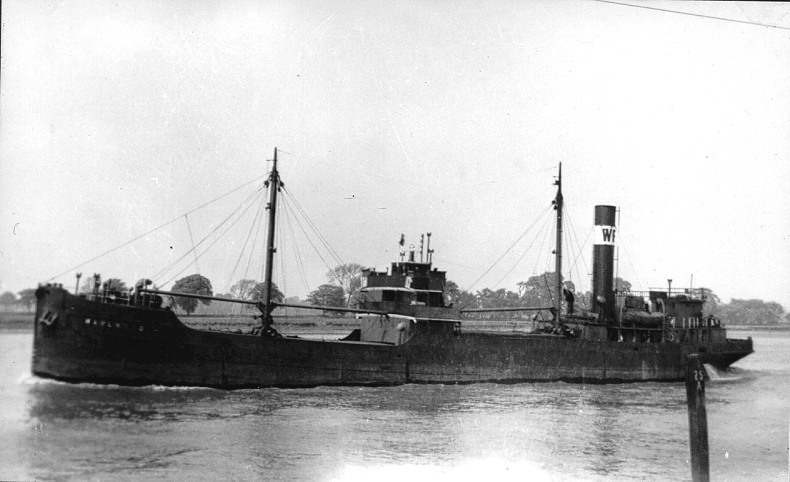 A modest cargo ship/collier perhaps, which had a long life, indeed it lived through both WW1 & WW2. Per 1 ('Plimsollshipdata.org', Lloyd's Register data, 1930/31 thru 1945/46), 2 (Miramar, link, you now must be registered to access). 43.1 metres long (142.1 ft.) perpendicular to perpendicular, ? speed, signal letters OTSG later TUTD. Built for Wear Steam Shipping Company Limited ('Wear'), of Sunderland, 'Thomas Rose' or maybe 'Rose Bros.', the managers. Wear, it would seem, went into liquidation in 1917. Two years prior however, in 1915, the vessel had been sold to Harris Bros ('Harris'), of Falmouth, & renamed Falmouth Castle. Have not found any data about her WW1 service. In 1923, the vessel was transferred to 'Falmouth Castle Shipping Co. Ltd.' ('Castle'), of Bristol (or maybe of Falmouth), with no change of vessel name. I use the word 'transferred' because Harris & Castle seem to have been related entities. In 1927, the vessel was sold to 'Soc. Anon. Les Caboteurs Alg�riens', of Algiers, Algeria, & renamed Carten�e. And sold again, in 1928, to 'Soci�t� Alg�rienne de Navigation pour l'Afrique du Nord', also of Algiers, & renamed Ville de T�n�s, 'Ch. Schiaffino & Cie.', the managers. Could it be that Schiaffino were also the owners? The vessel was requisitioned for WW2 service & served on the coasts of Sardinia as an auxilliary minesweeper, maybe AD245. Was it returned to its owners at the end of WW2? I do not know, but in 1946, the vessel was sold to 'Soci�t� G�n�rale de Transports Maritimes � Vapeur', of Marseilles, France, with no change of vessel name. And converted, I read to a part wine tanker. On Feb. 7, 1951, while en route from Marseilles to Susa, Tunisia, with a general cargo, the vessel was wrecked, in the Gulf of Orosei, on the E. coast of Sardinia. Any loss of life? I have not read anything about the circumstances. Is it possible that you can help with more data & perhaps an image? A steel single screw collier, schooner rigged it would seem. Per 1 (1916/18 Lloyds Register data, Bondicar), 2 (data, Broomhill Collieries, ref. Bondicar, approx. 12% down), 3 (Steel Recorder, collision, ref. 3.10.50), 4 ('convoyweb.org', WW2 convoy data, Bondicar), 5 (Miramar, link, you now must be registered to access). 240.3 ft. long, signal letters HQGC. Built for Broomhill Collieries Ltd. ('Broomhill'), of Newcastle, or maybe of Acklington, Northumberland. It would seem that the vessel was requisitioned by the British Government for WW1 service. 1 advises that in 1916 thru 1918 the vessel was owned by Broomhill of Newcastle & registered at Newcastle, 'H. Coates' then the manager. The vessel was owned by Broomhill as late as 1924. I am not sure where I saw that date. There probably were many later owners thru 1947. 71 WW2 convoy references, all U.K. coastal, but none recorded after Sep. 1942. I presume that there must have been later voyages, but 'convoyweb.org' denies me all access to 'independent' voyage data. In 1947, the vessel was sold to 'China Hellenic Lines', of Greece & was renamed Chryssoula. Later that year, the vessel was renamed Hellenic Chryssoula. On Oct. 3, 1950, the vessel, en route from Alexandria, (Egypt? ), collided with Steel Recorder. Not sure exactly where. Hellenic Chryssoula's stem was crushed & its anchor was lost. The vessel arrived at Newport, presumably Wales, on Jun. 4, 1954, to be broken up. Is it possible that you can help with more data & perhaps an image? A single screw cargo ship. Per 1 ('plimsollshipdata.org', Lloyds Register listings, multiple years, but many years seem to have no related image), 2 (data, Christian Salvesen, ref. Solent, approx. 85% down), 3 (ref. Solent, approx. 50% down), 4 (Salvesen), 5 (French data, image, 25% down '3 Le Yainville'), 6 (link 5 translated), 7 (extensive data in German, Varvara), 8 ('wrecksite.eu', wreck data & Varvara image), 9 ('convoyweb.org', WW2 convoy duty, click on 'SHIP SEARCH' then insert Varvara. Beware! The page you come to lists 86 convoys, only 4 of which relate to this particular vessel), 10 (Miramar, link, you now must be registered to access). 72.9 metres long perpendicular to perpendicular, 239.3 ft., speed of 9 knots, signal letters SZKY. Built for Dennis H. Willey, of Sunderland. Two later owners of Leith, Scotland, with no change of vessel name - to Christian Salvesen & Co., in 1916 & to T. C. Steven & Co., in 1919. Any service in WW1? In 1921, the vessel was sold to 'Josse Worms & Cie', of Le Havre, France, & renamed Yainville. A number of collisions as Yainville. At about 1:30 a.m. on Dec. 8, 1923, when at anchor in the Scheldt river at Antwerp, Belgium, the vessel was hit by Th�r�se, one of a number of vessels under tow by tug Charles. Something would seem to have happened at Bordeaux, on May 17, 1924. On Jan. 17, 1925, under the command of Captain Maheo, the vessel was in collision with Anaconda, again in the Scheldt River. On Aug. 31, 1930, in foggy conditions, the vessel was in collision with Marigot, 4 miles N. of Dunkirk, France. Yainville suffered bow damage. Am unclear, however, as to what happened to Marigot. In 1934, the vessel was sold to 'Nikolaos G. Livanos', of Piraeus, Greece, for �3,150, & renamed Mary II. In 1935, the vessel was sold again, to 'Athanasios N. Zoiopoulos' ('Zoiopoulos'), also of Piraeus (or perhaps of Volos), & renamed Varvara. By the 1940/41 edition of Lloyd's Register, the Ministry of War Transport had become the ship's owner, with Lambert Bros. Ltd. the managers. But in the 1942/43 edition of Lloyd's, ownership had reverted to Zoiopoulos. Can anybody explain what happened to cause such listings. Just 4 WW2 convoy references, including a voyage to Iceland in 1942. 2 of the 4 references relate to her final voyage from Alexandria, Egypt, which arrived at Tripoli on Mar. 16, 1943 with a cargo of munitions. On Mar. 19, 1943, the vessel was bombed by German Ju88 aircraft when 500 yards SW of the entrance to the harbour at Tripoli, Libya. Either 1 (Konstantinos Valeris) or (per Miramar & others) 2 lives were lost in the attack. The vessel sank on the next day, i.e. Mar. 20, 1943. This page (3rd item) indicates, I think in error, that the vessel was rather sunk by U-671. Is it possible that you can help with more data & perhaps another image? A collier. Per 1 ('uboat.net', sinking, Porthkerry), 2 ('wrecksite.eu' sinking data, Porthkerry), 3 (sinking data, 70% down, ref. 'Howson'), 4 (ref. Porthkerry), 5 (sinking data), 6 (Miramar, link, you now must be registered to access). 280 ft. long, 85.3 metres perpendicular to perpendicular, speed of 10 knots. Built for Porthcawl Steamship Co., of Cardiff, Wales, (Thomas, Stephens & Wilson, the managers). At 5.20 p.m. on May 20, 1917, Tycho, a defensively armed steamer of 3216 tons, was torpedoed & sunk by UB-40, Kapit�nleutnant Hans Howaldt in command, in the English Channel, 16 miles W. by S. of Beachy Head, Sussex. The entire Tycho crew left the ship & rowed towards Porthkerry, then standing by to pick up the survivors, having seen the explosion. The captain of Tycho & 15 of his crew died a few minutes later, alongside of Porthkerry, when one boat was blown up & the other was damaged by another torpedo, fired at Porthkerry by UB-40. It would seem that UB-40 purposely waited until the Tycho boats were alongside Porthkerry before firing its torpedo. Porthkerry was en route from Cardiff to Sheerness with a cargo of coal. 8 Porthkerry lives were lost, including the Captain (his name?). The survivors from both ships were picked up at 7 p.m. by a small coastal steamer, maybe Esperanto, which landed them at Newhaven. The Porthkerry wreck lies at 50.37.35N/00.18.58W in 42/46 metres of water, with Tycho nearby. A neat map of the location used to be WWW available (Brighton BASC). Can you provide more data? An image? A cargo ship. Per 1 (1944 collision, nr. page bottom, Wear), 2 ('convoyweb.org', WW2 convoy data, Wear. Beware - only the CO & OC convoys relate to this vessel), 3 & 4 (sinking), 5 (Miramar, link, you now must be registered to access). 81.7 metres long, perpendicular to perpendicular, 268 ft., 2 masts, speed of 9 knots. Constructed for Witherington & Everett, of Newcastle. Maybe soon sold? Because the vessel was registered at Melbourne, Victoria, Australia, in Mar. 1912. 65 WW2 convoy references, from Sep. 1942 thru Dec. 1943 - in CO & OC convoys, all in Australian waters, Newcastle to Melbourne & return. Presumably there were other & later voyages, maybe independent, but 'convoyweb.org' denies me access to such data. On Sep. 8, 1944, when owned by James Paterson & Co. Pty., (maybe 'Patterson') of Australia, & en route from Melbourne to Newcastle, New South Wales ('NSW'), Australia, in ballast, the vessel was in collision with the Norwegian Anatina, 9 or 10 miles S. of Montague Island, NSW, & sank. It would seem that Anatina, ran into Wear, striking her amidships at 1 a.m. And Wear sank 40 minutes later. I have not read the circumstances, but a Court of Marine Inquiry found that Wear was at fault. All 56 (maybe 32 only) crew were rescued 'but one seaman received fatal injuries', or perhaps was drowned. His name was Harold Pring. 'Both vessels were locked together for about ten minutes but the Wear was almost cut in half and sank immediately they separated.' A boat was launched but crew were in the water. The crew (or some of them at least) were landed by Anatina at Eden, NSW. A deep wreck, possibly (but not confirmed) to be Wear, has been located in 120 metres of water. WWW data is limited. Is it possible that you can help with more data & perhaps an image? It would seem that a half model of the ship was offered on eBay, but the item is long gone. A cargo ship. Per 1 (Miramar, link, you now must be registered to access). 67.8 metres long, perpendicular to perpendicular, speed of 9 1/2 knots. This ship is a mystery. Read on! The vessel was built for Witherington & Everett ('Witherington'), of Newcastle. I was surprised to find this second vessel named Wear (the first is here). Both seem to have been built by 'Crown' for Witherington at about the same time. As confirmed by a 'Crown' build list provided by a kindly site visitor. They survived, it would seem, until 1935 & 1944 respectively, & neither, per Miramar, had a change of name. Might that be because the '1911 edition', above, was soon registered in Australia? This Wear arrived, per Miramar, at Blyth, Northumberland, U.K., on Mar. 18, 1935, to be broken up. That is all I have! WWW data is most limited. And now the mystery, which seems likely to be related. Per this site, Witherington owned a vessel named River Wear, built in 1912, of 1164 net (not gross) tons. A vessel not apparently listed at Miramar. Could it be that Wear was renamed River Wear? There are 2 very fine images available of River Wear, via that site here (1 & 2). But we need your help. We need to know what Lloyds Registers of the 1920s said about both Wear & River Wear, & specifically the builder's name & gross tonnage. Likely any edition in the 1920s. Is it possible that you can help with that and/or with more data? An image? A collier which was launched on Sep. 29, 1913 & completed in Oct. 1913. Per 1 (Maindy Shipping, 1922, 80% down re Maindy Lodge), 2 ('plimsollshipdata.org', Lloyds Register ('LR') listings, 1930 thru 1945), 3 (Miramar, link, you now must be registered to access). Built for Tree Steamship Co. Ltd., of Cardiff, Howard Jones & King the managers. 258.0 ft. (78.64 metres) long, speed of 9 knots, signal letters HBQM, later TCDA, 197 HP engines by North Eastern Marine Engineering Co. Ltd., of Sunderland. In 1919, the vessel was sold, per Miramar, to 'Maindy Shipping Company Ltd.' ('MaindyCo'), also of Cardiff & in 1920 was renamed Maindy Priory. I had previously referenced 'Jenkins Richards E', 'Jenkins Richards E' would seem to correctly be 'Jenkins, Richards & Evans Ltd.' ('Evans'), of Cardiff, Wales. Muriel Goodman advises (thanks!) that 'Jenkins' refers to Thomas Jenkins, her grandfather, who owned MaindyCo. The name of Maindy would seem to originate with the area so named in the city of Cardiff. Evans were rather the managers. (There was also a company named 'E. Jenkins & Company', also of Cardiff.) Now MaindyCo went into liquidation in 1921. In 1922, per Miramar, the vessel became owned by Sir David R. Llewellyn ('Llewellyn'), of Cardiff (have also read Newcastle) - with James Rattary of Cardiff likely the manager. Llewellyn had in 1921 acquired ten MaindyCo steamers at auction, (A & B) including Maindy Priory, for a total of �290,000. The vessel was sold, in 1927, to the Government of Turkey (Admin de Nav. � Vap. Turque), registered at Constantinople (now Istanbul), & renamed Sinop. (I note in passing that the vessel is named Sinob in LR of 1928/29). It was later sold three more times to owners from Istanbul, Turkey, with no change of vessel name - to Denizyollari Idaresi in 1934, to Kirzade Mustafa & Huseyin Munir in 1935, & in 1937 to Turk Silepcilik Sti. (a ship management company or 'pool' established by the Turkish private shipowners). In 1938, Sinop & also Izmir (ex Kawi, built at Flushing, Netherlands, in 1907) went aground on the Black Sea coast at Ereğli but were floated off (images at left). It would seem, however, to have been owned by 'Mustafa Uman & Hamdi Selimoğlu' in 1948. On Nov. 30, 1948, while en route from Zonguldak (Anatolia, Black Sea coast of Turkey) to Istanbul with a cargo of coal, the vessel was driven ashore in a storm & wrecked on Kefken Island (just off the southern Black Sea coast, 92 km. E. of the Bosphorus). WWW data about the vessel is most limited. We thank Osman Ondes, maritime historian, for kindly correcting the texts above, particularly those re the vessel's Turkish ownership. Osman advises also that captain Ali Dolan II was in command of the vessel at the time of its loss & that the vessel's entire crew was drowned. Talat �lgezen was 2nd officer & Vasıf Kocak was the vessel's chief engineer. 'Cumhuriyet', a Turkish daily newspaper, extensively covered the sinking of the ship in its issue of Dec. 2, 1948. Need help! Another image? A cargo ship. Per 1 (Devon 'pdf' newsletter, true pages 6/8, with 2 images. Thanks so much 'AONB' & Ray Easterbrook! ), 2 (Miramar, link, you now must be registered to access). Built for Town Line (London) Ltd., (Harrison, Sons & Co. managers), of London. 67.1 metres long, perpendicular to perpendicular, 220 ft. A now dead web link indicated that in Jan, 1916, 'Harrison, Sons & Co.' were the owners. The vessel had a very short life! On Jan. 7, 1916, just 10 months after completion in Mar. 1915, she ran aground in fog at Barricane Beach, N. Devon, while en route from Oporto, Portugal, to Newport, Wales with a cargo of pit props. Near Morte Point, close to Woolacombe. Do look at the image at the first thumbnail. It sure does not look like a beach to me! However I read that there is a sand (or sea shell) beach there in a rocky cove! Interestingly, of sea shells not native to the area. How distressing it must have been to Captain Rees that his vessel so ended up - perched high on the rocks with bow & stern free & clear when the tide was out. The crew of 19 were all rescued, via the 'Mortehoe Life-saving Apparatus', a breeches buoy pulley system, the captain being the last to be rescued. WWW data about the vessel is limited. Need help! A collier/coaster. Per 1 ('convoyweb.org', WW2 convoy data, Lesto, beware other vessels at link), 2 (Miramar, link, you now must be registered to access). 81.7 metres long, perpendicular to perpendicular, speed of 10 knots. Built for 'Pelton Steamship Company Ltd.' ('Pelton'), of Newcastle. I am advised that Pelton owned coal mines & also owned a fleet of colliers trading to the Thames, S. coast ports & to the Baltic, sailing mostly from the Tyne, & returning from the Baltic with a deck cargo of sawn timber & pit props. Have WWW read nothing about the vessel's regular service history, but likely used as above. 35 WW2 convoy references including 2 N. Atlantic crossings ex Mediterranean (Alexandria & Port Said), service in Mediterranean, to the Continent (Seine Bay, France, in Aug. 1944, also Antwerp & Dieppe) & U.K. local. In 1954, the vessel was sold to 'British Iron & Steel Corporation (Salvage) Limited' ('BISCO') & was allocated by BISCO to 'Shipbreaking Industries, Ltd.', of Rosyth, Fife, Scotland, to be broken up. On Jun. 15, 1954, the vessel arrived at Rosyth, for that purpose. Can you provide more data? A cargo ship, likely a collier. Per 1 (interesting 'Witherington & Everett' history), 2 (ref. Kylequeen, about 20% down), 3 ('convoyweb.org', WW2 convoy data, Lightfoot), 4 (Miramar, link, you now must be registered to access). 81.7 metres long, perpendicular to perpendicular, 268 ft., speed of 10 knots, 199 HP engines by North Eastern Marine Engineering Co. Ltd. of Sunderland. 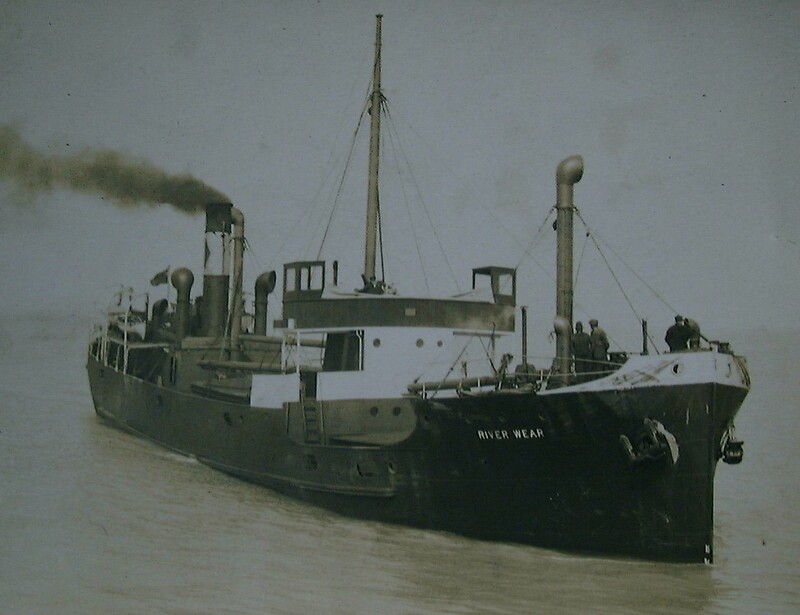 Built for 'The Hill Steam Shipping Co. Ltd.', of Newcastle, likely to replace the fleet vessel of identical name that was sunk by UB-30 in 1918. The company mainly carried coal, & chose names associated with rapid transport for its fleet ships, hence the name Lightfoot. The company had a tough time during the Depression, with 17 of its ships laid up - which resulted in the company being forced to sell half of its fleet in order to survive. But it did not sell Lightfoot at that time, it would seem. 63 WW2 convoy references, including service into the Mediterranean (Augusta, Brindisi, Naples, Malta, Port Said etc.) & many U.K. coastal. You would think, at 3, that the vessel made 4 eastbound voyages across the N. Atlantic, but when you access the convoy detail that was not so. The vessel was sold, in 1953, to Kyle Shipping Company Ltd., of Liverpool, Monroe Brothers the managers, & renamed Kylequeen. It was frequently used, I read, to transport iron ore, from Spain to the Barrow-in-Furness area. And from Liexoes, Oporto, Portugal, to Margam, Port Talbot, Wales. The vessel carried Welsh coal for many years, thru to 1962, to the Clarence Dock Power Station at Liverpool. Now William Rance has kindly been in touch to advise that he served as a Marconi Radio Officer onboard Kylequeen for three months in 1960. You will surely enjoy reading his recollections. Thanks Bill! On Jun. 12, 1962, the vessel arrived at Antwerp, to be broken up. Is it possible that you can add anything? Another image? A steel single screw steamer which was launched on Apl. 16, 1924 & completed in May 1924. Per 1 (near top, 25/03/2006 22:03), 2 (data & images), 3 (data), 4 (Miramar, link, you now must be registered to access). 212.0 ft. long (64.63 metres) perpendicular to perpendicular, signal letters KQPS, 166 HP engines by North Eastern Marine Engineering Co. Ltd., of Sunderland. Constructed for Quayside Shipping Co. Ltd., of Newcastle with Connell & Grace Ltd., the managers. 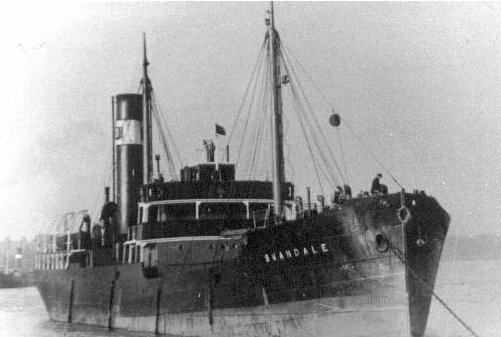 The vessel was sold, in 1930, to Yorkshire Dale S. S. Co., of Hull, (Atkinson & Prickett, the managers), & renamed Swandale. It was sold again, in 1938, to Wm. France, Fenwick & Co. & became Marlwood. It was sold (or maybe transferred) in 1952 to 'Wm. France, Fenwick (London/Goole) Ltd.' On Jul. 2, 1957, the vessel arrived at Dunston on Tyne, to be broken up. Can you add anything? A cargo ship which was launched on Apl. 4, 1928 & completed in May 1928. Per A (e-Bay image), 1 (data, Cedartree), 2 (wreck data, image), 3 ('plimsollshipdata.org', Lloyds Register ('LR') data, Cedartree, 1930/31 thru 1945/46), 4 ('convoyweb.org', WW2 convoy duty, click on 'SHIP SEARCH' then insert Cedartree), 5 (Miramar, link, you now must be registered to access). Built for Tree Steamship Co. Ltd., of London, owned certainly managed by Howard Jones Ltd. of London. 245.0 ft. (74.7 metres) long, single screw, 254.0 ft. long overall, speed of 10 knots, signal letters LPBW, later MNET, 193 HP engines by George Clark Ltd., of Sunderland. The vessel must have been sold a couple of times, without a change of vessel name. James Scott, of Newcastle, advises (thanks James!) that Home Line Limited ('Home'), perhaps owned by The Northumbrian Shipping Company, Common Brothers Limited the managers, owned the vessel in 1937 (per a Cedartree insurance policy/certificate James owns). Such data is confirmed by LR data re 1937/38. Prior to that edition, from 1933/34 thru 1935/36 LR listed no owner name but reported F. W. C. Common as being her manager. Home later, in 1938, sold the vessel to Shamrock Shipping Co. Ltd., of Larne, (N. of Belfast), Northern Ireland with the vessel registered at London. W. C. Lawson became the vessel's managers from, per LR, 1940/41. 55 WW2 convoy references, almost all of which are U.K. coastal with 5 trips to France (Seine Bay). In 1956, the vessel was sold to P. Vrangros of Panama & renamed Bluebell. And in 1958 was renamed Silverbell. Also in 1958, the vessel was sold to Italian owners (V. Scarcia? ), & renamed Pepinella. Per Miramar such owners were rather 'Cia. Esercizi Marittima Manfredonia'. On Apl. 20, 1958, the vessel collided with Sunoak & sank on the northern part of 'Fairybank', while en route from Venice, Italy, to Amsterdam, on its first voyage under Italian ownership. At 51.24.341N/ 02.15.087E. 'Fairybank' is, it would seem, in the North Sea, E. of Broadstairs, Kent. The wreck lies upright in about 30 metres of water. 4 has a slightly different wreck location. Wreck 'in quite good shape', described as being a pretty wreck. Can you add anything? A coaster, a collier, which was launched on Jul. 10, 1929 & completed later that month. Per 1 & 2 (same image, John Charrington, blue), 3 ('plimsollshipdata.org', Lloyds Register data, John Charrington, 1930/31 thru 1945/46), 4 ('convoyweb.org', WW2 convoy data, John Charrington), 5 (Miramar, link, you now must be registered to access). Built for Charrington Steamship Co. Ltd., of Dartford, London, which company was owned, certainly managed by 'Charrington, Gardner, Locket & Company, Limited', noted for its involvement in the coal trade. A 1931 volume about the company, by Bernard Darwin, was entitled 'Two Hundred Years in the London Coal Trade'. 'The largest retail coal distributing company in the country'. Vessel named after John Charrington (there were many of the name in the history of the company). 250.0 ft. long (76.2 metres) perpendicular to perpendicular, speed of 10 1/2 knots, with a woodbine funnel, signal letters MPNX, 226 HP engines by North Eastern Marine Engineering Co. Ltd., of Sunderland. Launched by Elizabeth, John Charrington's wife. Carried coal to the Thames & other places in the S. of England. 51 WW2 convoy references, all of which were U.K. coastal to & from Southend (Thames estuary). On Apl. 16, 1959, the vessel arrived at Bruges, Belgium, to be broken up. Can you add anything? A ferry or excursion ship. Per 1 (data and images), 2 (fine image, at Scarborough, posted 1938), 3 (ref., 2nd para. ), 4 (Miramar, link, Royal Lady, you now must be registered to access, 3rd item). The only vessel built on the River Wear during the period 1932/1936 (the Depression). Built for Thomas Round & Sons, of Scarborough. 2 funnels, the forward funnel being a dummy. 132.6 ft. long, twin-screw Crossley engines, speed of 9 1/2 knots - the Crossley engines required far less space than previous steam installations, allowing a far greater area to be devoted to passenger accommodation. The vessel was sold, in Sep. 1937, to 'Captain Orazio Mizzi', of Malta, for service between Malta (Marfa) & the Island of Gozo (Mgarr). In 1938, while maintaining that route, she was transferred to the Gozo mail service. On May 7, 1942, while at the quayside at Gozo, the vessel was sunk by German bombing. Can you add anything? A ferry or excursion ship. A large listing for a modest vessel. Per 1 (wreck), 2 (lots of data and images), 3 (map of wreck - Imperial Eagle), 4 [General Steam Navigation, Crested Eagle (2)], 5 (Crested Eagle, data & images), 6 (Miramar, link, New Royal Lady, you now must be registered to access). 45 metres (150 or 138 ft.) long, 250 tons, speed of 14 (or 13) knots, 2 funnels, the forward funnel a dummy. 'Her funnels were yellow, with rather gaudy red, white and blue bands.' Accommodation for 70 passengers & later in its life (when?) 10 cars. 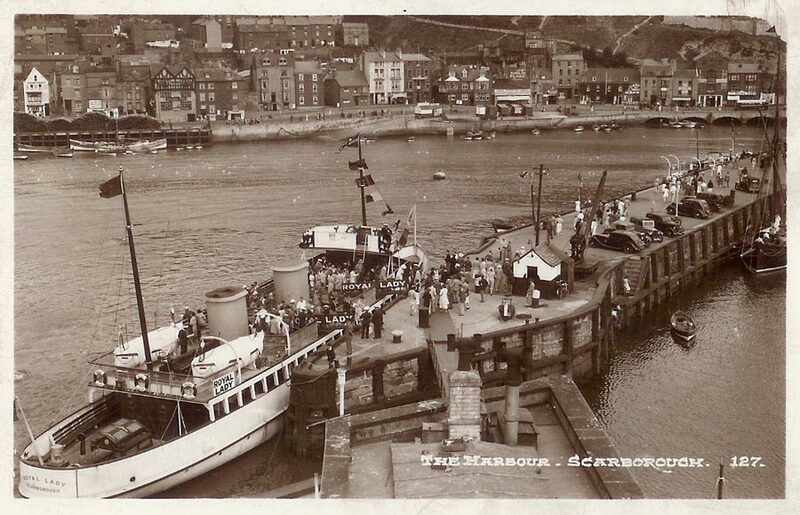 The vessel, which replaced the earlier Royal Lady, was built for Thomas Round but when he died the vessel was delivered to his son John C. Round ('Round'), of Scarborough, for excursion trips from that port. Used for morning, afternoon & evening trips from Scarborough & occasionally for longer trips to Bridlington and Whitby. In 1940, the vessel was requisitioned by the Royal Navy for transport duties. In 1942 it was purchased by the Ministry of War Transport, managed by Fraser & Wright. In 1944, the vessel was attached to the U.S. Navy - engaged on port defence duties. Somewhere in that period, it lost its forward dummy funnel. The vessel was sold to Round again, in 1946. 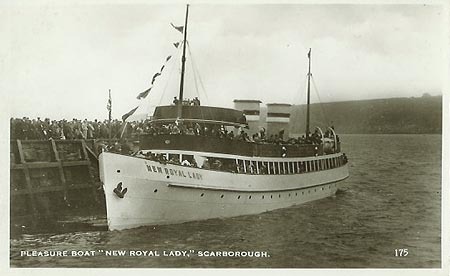 In 1947, the vessel was sold to John Hall of Kirkaldy, for Firth of Forth service, & renamed Royal Lady. 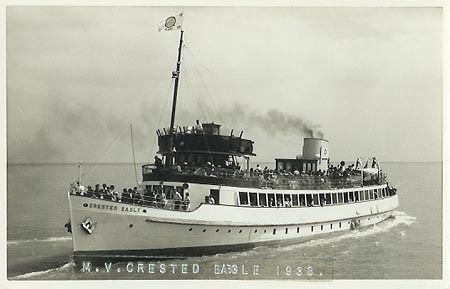 And sold, later in 1947, to 'General Steam Navigation Co.' ('GSN') for cruises (London to Gravesend & Southend on the River Thames & Port of London) & renamed Crested Eagle. In 1952, the vessel was used for local trips from Ramsgate. In 1956, the vessel ran a regular service from Gravesend to Southend & Clacton. In 1957, it was chartered by 'P. & A. Campbell Ltd.' of Brighton, for service along the S. coast of England (Eastbourne, Hastings, Brighton, Shanklin on the Isle of Wight). In mid 1958, the vessel was sold by GSN to 'E. Zammit & Co.' (owned by Karistu Zammit, perhaps), of Malta, for service on the Marfa to Mgarr route [Malta to sister island of Gozo (Ghawdex)] & occasionally to Sicily (vessel considered a 'bad sailer' - but she maybe was not built for such a voyage?). At this time, the vessel would seem to have carried 10 cars. Sold to 'Sunny & Maria Pisani', of Gozo, & renamed Imperial Eagle. After 1968, she transported cargo & animals from Gozo to Valletta, Malta. 'For at least 10 years she then lay rotting in Mgarr harbour (Gozo) & was eventually towed to Valletta harbour where she was badly vandalised & half sunk at her moorings.' Served as a hulk? ('She also served for storage'). On Nov. 28, 1995, the vessel was sold to the local diving community & on Jul. 19, 1999 was scuttled, in 40 meters of water, at St. Paul's Bay, 1/2 km. off Qawra Point, Malta, as part of an 'Underwater Marine Park Project'. An easy dive site today. Can you add more? 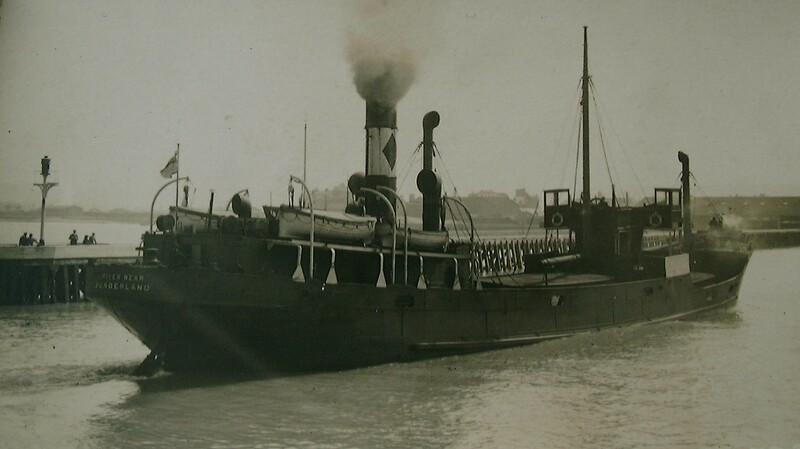 A 'Warrior' class coal fired tug. Per 1 & 2 (fine giant 'callen' images), 3 (references to vessel), 4 & 5 (James Wolfenden artwork), 6 (Miramar, link, you now must be registered to access). 32.9 metres (114.5 ft.) long, speed of 11 knots. Operated, it would seem, in many ports throughout Britain in its lifetime. Built for the Ministry of War Transport for use by the U.K. Navy. The vessel was sold, on May 15, 1946, for �18,750 to 'Clyde Shipping Co Ltd', of Glasgow & renamed Flying Fulmar. It was sold again, in May 1956, to 'Alarm Steam Tug Co. Ltd.', of Bristol & renamed Sea Alarm. In Jan. 1973, the vessel was sold to 'T. W. Ward Ltd.', of Briton Ferry, South Wales, for demolition. But it was not then demolished! Rather it was sold, in Feb. 1973, to 'Welsh Industrial & Maritime Museum' in Cardiff, Wales, & for many years, preserved there in a dry-dock (Roath Dock). The Museum closed in 1998. The museum site would seem to have become a shopping centre. The vessel itself was scrapped while 'the engine and some auxiliary plant is in a store at Nant Garw'. For a large portion of the above data I thank 'Tug' of Thames Tugs, who kindly noted my earlier request for data. And came to my rescue. 'Tug', I thank you. Can you add more? A 'Warrior' standard class coal fired tug. Per 1 (Miramar, link, you now must be registered to access). Built for Ministry of War Transport. The vessel was sold, in 1946, to Steel and Bennie Ltd. of Glasgow & renamed Brigadier. On Feb. 21, 1960 the vessel ran aground & was wrecked at Horse Island, off Ardrossan, on the North Ayrshire coast of Scotland. The vessel was a total loss. Is it possible that you have an image? A 'Warrior' standard class coal fired tug. Per 1 (data & image ex Ray Fothergill 70% down), 2 ('uboat.net'), 3 (crew photo - Ray Fothergill - more images 4, at page bottom), 5 (names of 7 of the 10 crew lost. 52% down, ref. 'Friday, 10 November 1944'), 6 (data re sinking), 7 (Miramar, link, you now must be registered to access). 107.8 feet long, speed of 12 knots. Built for the Ministry of War Transport. The vessel was placed on naval duties including convoy duties, based in Reykjavik, Iceland. On Nov. 10, 1944, the vessel departed Reykjavik to assist British tanker Shirvan (6017 tons, bound for Hvalfjord, Iceland, with a cargo of gas-oil), a vessel in the U.K. to Reykjavik convoy UR.142. The tug & crew were never seen again. While German records (also 6) list Empire Wold as having been sunk by German submarine U-300 (along with Shirvan & Godafoss), other German records do not confirm that U-300 actually sank her & the tug may have rather been, in fact, overwhelmed by the heavy seas. Sank at 64.08N/22.38W (or thereabouts). Can you add anything? A 'Warrior' standard class coal fired tug. Per 1 (extensive data & image), 2 (Miramar, link, you now must be registered to access). Built for The Admiralty. 108 ft. long. A369. 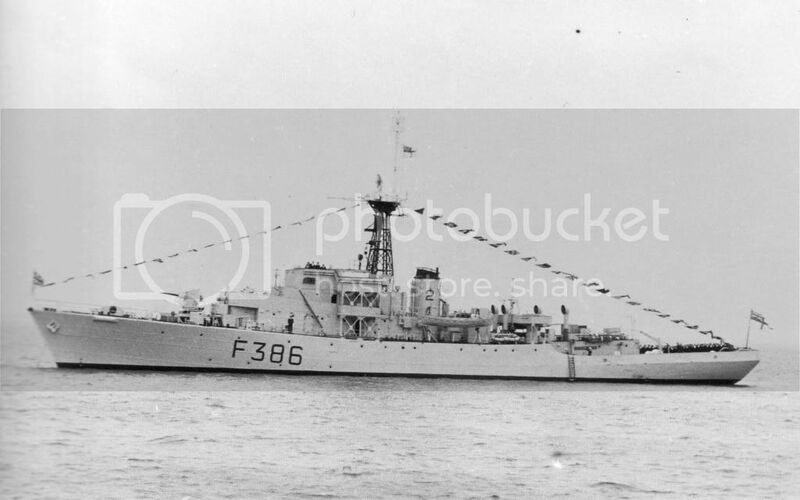 An 'RFA' vessel (Royal Fleet Auxilliary) but am not sure of the relevant dates. The vessel was transferred, in 1945, to the Ministry of War Transport. And transferred back to The Admiralty in 1949. In 1962, the vessel was chartered to the U.S. Navy for service in the River Clyde area. In 1964, it was 'Transferred to HMS SEA EAGLE, training school, Londonderry.' I understand that 'Sea Eagle' was a naval shore-based anti-submarine training establishment. The vessel's name was presumably not changed. On Mar. 26, 1965, the vessel was in collision with Norse Lion, while she was towing her in Lough Foyle, (the estuary of the River Foyle, in Ulster, Northern Ireland) & Empire Demon was holed. This Norse Lion? The vessel was soon declared to be beyond economical repair & on Nov. 19, 1965, was advertised for sale, 'as lying', at Belfast. On Jan. 24, 1966, the vessel was sold to 'Haulbowline Industries Ltd.', of Passage West, County Cork, Eire, to be broken up. But it never arrived there. The vessel, in heavy weather off Wexford, (County Wexford, near SE tip of Ireland) broke her tow to Passage West on Feb. 15, 1966, & put into Dublin for stores & water. There her crew deserted her & she ended up sold to local ship breakers. On Mar. 14, 1966, the vessel was broken up at Dublin. Is it possible that you can add anything? Another image? A Modified 'Warrior' class oil fired tug. Per 1 ('convoyweb.org', WW2 convoy data, Empire Dolly), 2 (data, Thunderer, 45% down), 3 (Canadian 1964 court case referencing Ocean Osprey), 4 (Miramar, link, you now must be registered to access). 106 ft. long. Built for the Ministry of War Transport. Just 2 WW2 convoy references, which together comprise a single voyage from Milford Haven, Pembrokeshire, Wales, to Alexandria, Egypt, in Oct/Dec 1943. I read that in Jul. 1946, Empire Dolly was employed in the docks at Alexandria, Egypt - but it would seem that that assignment may well have commenced rather earlier - in Dec. 1943. It is possible, however, that the vessel returned to the U.K. independently, between the relevant dates, which 'independent' data I am denied access to at 'convoyweb.org'. You will be able to check that data. In Oct. 1948, the vessel was transferred to British Army service at Suez, Egypt. The vessel was sold, in 1953, to 'Steel and Bennie Ltd.' of Glasgow, & renamed Thunderer (more than one tug of that name). And sold again, in 1958, to Saint John Tugboat Co. Ltd., I believe of Saint John, New Brunswick, Canada, & renamed Ocean Osprey - though still in Glasgow registry. Many sites refer to the vessel being owned by a Bermuda company. But I suspect, based upon what I WWW read, that the vessel was not sold to a Bermuda company. Alas, WWW sites, this one included, tend to be repeat one another's errors of fact - so incorrect data, repeated many times, seems by that repetition to become truth. Am I correct about the acquirer not being of Bermuda? Is it possible that you can add anything? An image? A Modified 'Warrior' standard class oil fired tug. Per 1 (detailed data), 2 (Miramar, link, you now must be registered to access). Built for the Ministry of War Transport. 105 ft 9 in. long. Initially used, until Nov. 1944, on U.K. coastal towing operations. Then taken over by The Admiralty & sent to Bombay, India, & then, a short period later, on to Singapore. In May 1947, the vessel was permanently attached to The Admiralty. Later in 1947, the vessel was renamed Elf. In 1959, the vessel was offered for sale 'as is' (or perhaps 'as was') & in 1960 was sold for �17,300 to 'Augustea Imprese Maritime S.p.A.', (I think that is correct), of Palermo, Italy & renamed Mare Jonio. Have read that the vessel was transferred to the Italian Navy, in 1972, & then named Ercole. Still in service early in 1988? Per Miramar, the vessel was stricken from the register in 1989. Is it possible that you can add anything? An image? A Modified 'Warrior' standard class oil fired tug. Per 1 (data, 2nd image, Asta), 2 ('convoyweb.org', WW2 convoy data, Empire Nicholas), 3 (Miramar, link, you now must be registered to access). Built for the Ministry of War Transport. 106 ft. long. 4 WW2 convoy references including 3 voyages to Seine Bay, France, in Jul/Sep 1944 re Normandy landings. And also a Mar. 1945 voyage from St. Helen's Roads, Isle of Wight, to Le Havre. Initially used, until Oct. 1944, on U.K. coastal towing operations. Then on naval duties which became service in Japan (from Dec. 1945) & from Mar. 1946 Batavia (now Jakarta, Indonesia). 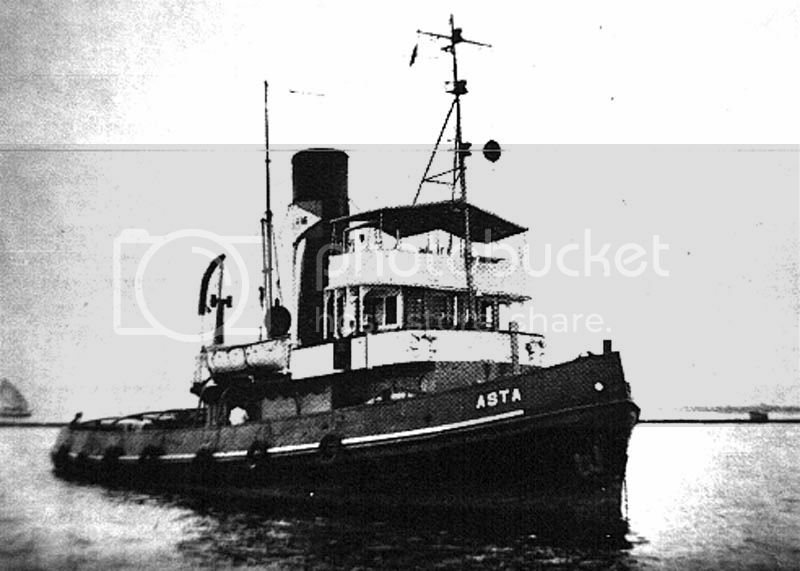 In 1947, the vessel was sold to the Netherland East Indies Government, & renamed Asta, (but maybe instead to 'Nederlandsche Indische Steenkolen Handel Maats'. In 1949, the vessel was sold to 'Nederlandsche Indische Steenkolen Handel Maats' which later became 'NV Nederland Indonesia Steenkolen Handel Maats' (the data conflicted). In 1959, the Indonesian Government took over all local Dutch maritime interests including the above company. In about 1959, the vessel was 'transferred' to 'Perusahaan Negara Tundabara' which later became 'P. N. Pelejaran Bahtera Adhiguna', of Indonesia. In 1961, the vessel was renamed Laut Arafura. In 1964, the vessel was 'transferred' to Tanjung (or Tandjung) Priok Port Authority, of North Jakarta, Indonesia. Still in service early in 1988? No later data. WWW data re the vessel is almost non-existent. Is it possible that you can add anything? A collier. Per 1 (extensive data, 4 images, Arnewood. Do visit this remarkable page), 2 (Lloyd's Register, 1945/46 data, ex 'plimsollshipdata.org'), 3 (2 fine copyrighted images, Arnewood), 4 (Miramar, link, you now must be registered to access). There used to be a link, alas now gone, run by Alf Cook of Denbighshire, N. Wales, where photos of the vessel were, I think, available. 86.6 metres long perpendicular to perpendicular, 273.0 ft., speed of 9 1/2 (or 10) knots, signal letter GLJC. Built for the Ministry of War Transport, with William France, Fenwick & Co. ('Fenwick'), of London, the managers (have also read London & Edinburgh Shipping & Co. Ltd.). The vessel was sold, in 1946, for �78,500, to Fenwick & was renamed Arnewood. On Oct. 26, 1947, the vessel went aground in the River Tyne. There was no damage & the vessel floated off at the next high tide. On Dec. 2, 1947, with a cargo of coal, when just opposite William's Wharf at Dagenham, River Thames, Arnewood collided with Belhaven, also bound for London, (ex Leith, Scotland), with a general cargo. Belhaven suffered severe damage, while the damage to Arnewood was quite modest. There were three incidents, in 1951 & 1952, two of them with a cargo of esparto grass, where boiler tubes burst. The vessel was delayed each time, the repairs were effected with difficulty, but the ship was not in any danger. On Jan. 24, 1954, when in ballast at Antwerp, Belgium, the vessel collided with Dormitor, (Miramar seem not to list the vessel - could the vessel have rather been Durmitor). From Jan. 12, 1960 to May 12, 1960, the vessel was laid up at the River Tyne. On that last date, i.e. May 12, 1960, the vessel was sold, to George & Panos Kouremenos, of Piraeus, Greece, George Kouremenos the manager, & became Elias K. In mid Jan. 1967, the vessel was en route from Gizan, Saudi Arabia, bound for Varna, Bulgaria, with a cargo of bagged cement. At 7:15 a.m. on Jan. 17, 1967, in heavy seas, the vessel ran aground & was left stranded on a reef off Farasan Island in the southern Red Sea. At 16.23N/41.48E. Attempts were made to refloat the vessel, which was listing & taking on water, but the crew were forced to abandon ship in two lifeboats. Greenville Victory delivered the crew safely to Port Said. With great difficulty, including the jettisoning of cargo & ballast, Svitzer, a salvage tug, was later able to refloat the vessel & tow it to Aden for temporary repairs. The damage was thought to be slight. It then sailed to Piraeus, where the damage was determined instead to be uneconomic of repair. The vessel was laid up & later towed to Split, Yugoslavia, (Sveti Kajo? ), where it was broken up, in Dec. 1967. Most of the above text is derived from the most extensive data at 2, for which we thank, (I believe), Mike West. There is, indeed, far more data there than can & has been included here. Anything you could add? Another image? A Modified 'Warrior' class oil fired tug. Per 1 & 2 (Italian sites with references to Empire Phyllis & Favignana), 3 (Miramar, link, you now must be registered to access). Built for the Ministry of War Transport. 106 ft. (or 105 ft. 9 in.) long. Engaged in the India & Ceylon area for East Indies Command. On Jan. 20, 1947, the vessel was sold to Anglo-Iranian Oil Co. Ltd., of London, (no change of name). In 1948, the vessel was sold to Kuwait Oil Co. Ltd. of London, & renamed Hayat. And in 1961, it was sold again, to 'Augustea Imprese Maritime S.p.A.', (I think), of Italy, & renamed Brucoli. In 1973, it would appear to have been sold, for the last time, to the Italian Navy at Messina. Two Italian sites indicate, I believe, that it was then renamed Favignana, A5305. But I am not sure, with my inability in Italian, that I truly understand the texts. It is possible that there are images there. Later broken up but I cannot advise exactly when or where. Can you add anything? An image? A Modified 'Warrior' class oil fired tug. Per 1 (Miramar, link, you now must be registered to access). Built for the Ministry of War Transport. 106 ft. (or 105 ft. 9 in.) long. Launched on Dec. 22, 1945. Intended to be used by East Indies Command, however she was rather laid up as surplus to the then requirements. In Apl. 1946, the vessel was sold, for �37,500, to Petroleum Steamship Co. Ltd., of London (no change of name). In 1947, the vessel was renamed Daneshmand. In 1958, it 'was transferred' to BP Tanker Co. Ltd., of London. In 1972, the vessel was sold again, to Gulf Shipping Co. SA, of Iran, & renamed Danesh. On Jan. 20, 1975, while towing barge GULF 107, the vessel was in collision with Arya Tab in the 'Khor Musa Channel' at Khorramshahr in SW Iran (close to Abadan). I have read no detail but understand that Danesh was a total loss. Is it possible that you can add anything? WWW data is most scarce. Perhaps an image? A collier which was launched on Jul. 15, 1946 & completed in Sep. 1946. Per A (e-Bay image, Dashwood), 1 (France Fenwick, Dashwood), 2 (image), 3 (Miramar, link, you now must be registered to access). 273.0 ft. long (83.21 metres) perpendicular to perpendicular, 284.0 ft. long (86.56 metres) overall, speed of 9 1/2 knots, signal letters GNCM, 254 MN (can somebody tell me what MN means. Equivalent of Horsepower?) engines by North Eastern Marine Engineering (1938) Ltd. of Sunderland. Laid down for the Ministry of War Transport as Empire Lambeth. But completed as Dashwood for William France, Fenwick & Co. Ltd., of London. In late 1955, the vessel carried at least 4 shipments of coal to the Tyne ex Gdynia, Poland. A 'Google' snippet ex Fairplay Weekly Shipping Journal, Vol. 99, 1961 'in 1958 fitted for oil fuel'. I have read that the vessel was sold in Mar. 1961 with engine damage when at Rotterdam. To her ship breakers, presumably? In Jun. 1961, the vessel was scrapped at the ship breaking facilities of 'NV Arie Rijsdijk-Boss & Zonen' at Hendrik Ido Ambacht, a town in the Western Netherlands, famous for its ship breaking yard. Data is scarce! Can you add anything? A collier. Per 1 (Empire Lowlander), 2 (sinking, Rosa Vlassi, images), 3 (Miramar, link, you now must be registered to access). 86.5 metres long, perpendicular to perpendicular, 268 or 273 ft., 283.7 ft. overall, speed of 9 1/2 knots. Built for the Ministry of War Transport. The vessel was sold, in 1946, to William Cory Ltd. (or maybe William Cory & Son Ltd.), of London, & renamed Corflow. It was sold again, in 1959, to G. Vlassis & Co., (George & Alexander Chr. Vlassis), of Piraeus, Greece, & became Rosa Vlassi. On Dec. 25, 1959, Pavlos Koskorozis in command, with a crew of 18 all told, while carrying a cargo of iron pyrites from Stratoni (NE Greece) to Piraeus, the vessel's cargo shifted (due to water in the hold) while off the E. coast of Attica, Greece, between Laurium & Makronesi. The vessel capsized & sank in a southerly gale. At 37.37N/24.02E. It would seem, per 2, that 5 lives (the Captain included) were saved by taking to the boats just before the vessel capsized, & one additional crew member was saved by Elpis, a fishing boat. So 12 lives were apparently lost. But Aris Bilalis advises (thanks Aris!) that only 10 lives were in fact lost, since 2 of the 18 were not in fact on board. A demanding dive site today, the vessel being substantially intact, at a depth of about 60 metres. Do you have anything to add? A cargo ship. Per 1 (extensive data, in Norwegian, image, Andwi). An unusual vessel in that Miramar seems not to record it. So I particularly thank the folks at 'sjohistorie.no', the sole data source. 269.6 ft. long, speed of 10 1/2 knots, signal letters LHML. Built for 'Rolf Wigand Rederi', of Bergen, Norway. In Oct. 1952, the vessel was sold to A/S Wilhelms Rederi (T. Wilhelms), of Fredrikstad, also Norway, & renamed Manx King. In Jul. 1955, the vessel was sold to D/S A/S Fro, August Kjerland & Co. A/S the managers, of Bergen, & renamed Aco. It was sold again, in Dec. 1960, to Halfdan Backer A/S, Backers Rederi A/S ('Backers'), the managers, of Kristiansand, Norway, & renamed Bremsnes. In 1962, Backers became the owners. In May 1967, the vessel was sold again, to Antonio Olivers, of Torre del Greco, Italy, & renamed Monte Bendone. In 1969, the vessel was sold to 'Navale Cala di Volpe S.p.a.', of Cagliari, Sardinia, & renamed Marisol. And sold again, in 1973, to Giovanni Palomba, of Naples, Italy, & renamed Rosy Palomba. On Jan. 15, 1975, the vessel arrived at the La Spezia, Italy, ship breaking facilities of Carteri Navale Santa Maria, to be broken up. Can you add to and/or correct the above? A cargo ship. Per 1 (extensive data in Norwegian & English, & 2 images), 2 (Norwegian data, image), 3 (Miramar, link, you now must be registered to access). 78.8 metres long perpendicular to perpendicular, 258.7 ft., speed of 12 (or maybe 11) knots. Built, at a cost of 3,484,000 Norwegian kroners, for A/S Lukesfjell, 'Fjell Line', (Olsen & Ugelstad the managers & possibly the owners also), both of Oslo, Norway. Intended for use in the London/Great Lakes trade. The vessel was sold on Apl. 12, 1957, for 5,000,000 kroners to 'Skips-A/S Thor Thoresens Linje' (Thor Thoresen & Co.), also of Oslo, & in 1958 was renamed Skotfoss. In 1961, the vessel was sold to '�ngfartygs-AB Adolf' (Adolf Bratt & Co. AB, the managers), of Gothenburg, Sweden, for GBP 56,408 (Erik Kekonius involved in some way?) & renamed Barbro Bratt. On Jul. 31, 1964, the vessel was 'taken over' by G. Bratt & Co., of Gothenburg. On Mar. 2, 1965, the vessel was sold again, to Kyknos Steamship Corp. (Equatorial Shipping Co. S.A., the managers), of Monrovia, Liberia, for Swedish kroners 151,600, (Frangos Bros. & Co. somehow involved?) & renamed Kyknos. In Jul. 1967, the vessel was sold to Pierfrancesco Ursino, of Naples, Italy, & renamed Giuseppe U. In Jul. 1971, the vessel was sold, for U.S. $100,000 to 'Thallo Shipping Co. Ltd.', of Famagusta, Cyprus, & renamed Thallo. On Oct. 1, 1971, the vessel left Hamburg, Germany, under tow by Fairplay XI, for Santander, Spain, to be broken up. But was later moved to Bilbao, Spain, where she arrived on May 6, 1972 for the same purpose. Can you add to and/or correct the above? A cargo ship. Per 1 (Norwegian & English data), 2 (wreck location), 3 (Miramar, link, you now must be registered to access). 78.8 metres long, perpendicular to perpendicular, 258.7 ft. long, speed of 11 knots. Built, at a cost of 3,484,000 Norwegian kroners, for A/S Rudolf, 'Fjell Line? ', (Olsen & Ugelstad the managers & possibly the owners also), both of Oslo, Norway. On May 25, 1953, while en route from Antwerp, Belgium, via London, to Chicago, U.S.A., with a general cargo, (have also read Rotterdam, Holland, to Glasgow), the vessel was in collision with Dotterel, (1541 tons, built 1934 as Dundee), 11 miles SWxW of Start Point, Devon, U.K. At 50.09.14/03.50.02. And was lost. It would seem that with extensive bow damage, Ternefjell must have run into Dotterel. I read that the underwriters paid 3,200,000 Norwegian kroners in compensation. In 1955, (or maybe 1975 since both dates are mentioned), salvage activities were conducted on the wreck, which lies in 72 metres of water, at 50.06.4369/03.51.2861. Can you add to or correct the above? A collier, which became a bulk cement carrier. Per 1 (Miramar, link, you now must be registered to access). 71.7 metres long overall, 68.4 metres perpendicular to perpendicular, speed of 9 1/2 knots. Poole Harbour had single berth cabins for all of the crew & probably Poole Channel did also. Built for 'British Electricity Authority' ('Authority'). Which became 'Central Electricity Authority' in 1954 & 'Central Electricity Generating Board' in 1958. It would seem, but do correct me if I have misunderstood, that the vessel was ordered by 'Coastwise Colliers Ltd.' ('Coastwise'), a company formed by 'Wm. France Fenwick and Co. Ltd.' & 'Stephenson Clarke Ltd.' re the chartering of vessels to 'County of London Electric Supply Co. Ltd.' - for the purpose of transporting coal to London power stations. But with the nationalization of the U.K. electricity industry in 1948, Coastwise went into liquidation, Authority took over the contract & took delivery of the vessel. When the generating stations switched from coal to oil, colliers such as Poole Channel became redundant. So in 1959, the vessel was sold, for about �35,000, to 'Associated Portland Cement Manufacturers Ltd.', of London, & renamed Aquacrete, with 'Cory Colliers' or maybe with 'Blue Circle Shipping Co. Ltd.' ('BlueCircle'), also of London, the managers. To be converted (where I wonder) into a bulk cement carrier. In 1959, it was sold to BlueCircle, with no change of name. In 1962, the vessel was sold to "Castelsardo" Societa di Navigazione SpA, of Cagliari, Sardinia, Italy, & renamed Donippo. On Nov. 13, 1975, the vessel arrived at the ship breaking facilities of 'CN del Golfo', at La Spezia, Italy, to be broken up. A most difficult vessel to WWW search for. Can you add to and/or correct the above? A collier, which became a bulk cement carrier. Per 1 (Miramar, link, you now must be registered to access). 71.7 metres long overall, 68.4 metres perpendicular to perpendicular, speed of 9 1/2 knots. Had single berth cabins for all of the crew. Built for 'British Electricity Authority' ('Authority'). Which became 'Central Electricity Authority' in 1954 & 'Central Electricity Generating Board' in 1958. It would seem, but do correct me if I have misunderstood the 'snippets' of WWW data I have been able to access, that the vessel was ordered by 'Coastwise Colliers Ltd.' ('Coastwise'), a company formed by 'Wm. France Fenwick and Co. Ltd.' & 'Stephenson Clarke Ltd.' re the chartering of vessels to 'County of London Electric Supply Co. Ltd.', for the purpose of transporting coal to the London power stations of Barking & Littlebrook, respectively on N. & S. banks of the River Thames. But with the nationalization of the U.K. electricity industry in 1948, Coastwise went into liquidation, Authority took over the contract & took delivery of the vessel. When the generating stations switched from coal to oil, colliers such as Poole Harbour became redundant. So in 1959, the vessel was sold, for about �35,000, to 'Associated Portland Cement Manufacturers Ltd.', of London, & renamed Colorcrete, with 'Blue Circle Shipping Co. Ltd.' ('BlueCircle'), also of London, the managers. To be converted (where I wonder) into a bulk cement carrier. In 1960, it was sold to BlueCircle, with no change of name. In 1963, the vessel was sold to W. N. Lindsay Ltd., of Leith, Scotland, & renamed Roseneath. On Dec. 16, 1968, the vessel arrived at the ship breaking facilities of 'Arie Rijsdijk, Boss en Zonen BV', at Hendrik-Ido-Ambacht in the Netherlands. Not an easy vessel to WWW search. Can you add to and/or correct the above? A collier, which became a bulk cement carrier. Per 1 (image, Poole Sound, but you must now be registered to see it), 2 (Miramar, link, you now must be registered to access). 71.7 metres long overall, 68.4 metres perpendicular to perpendicular, speed of 9 1/2 knots. Built for 'British Electricity Authority'. Which became 'Central Electricity Authority' in 1954 & 'Central Electricity Generating Board' in 1958. Converted along the way to oil burning itself (at Sunderland it would seem). When the generating stations switched from coal to oil, colliers such as Poole Sound became redundant. So in 1959 the vessel was sold, for about �35,000, to 'Associated Portland Cement Manufacturers Ltd.', of London, & renamed Walcrete, with 'Blue Circle Shipping Co. Ltd.' ('BlueCircle'), also of London, the managers. To be converted (where I wonder) into a bulk cement carrier. In 1960, it was sold to BlueCircle, with no change of name. In 1966, the vessel was sold to 'General Cement Co. S.A.', of Piraeus, Greece, & renamed Tsimentavros. In 1972, the vessel was sold to 'Heraclis Shipping Co. S.A.', also of Piraeus, with no change of name. In 1974, the vessel was sold to 'Korali NE Ltd.', of Piraeus, & renamed Stavros. In 1975, the vessel was sold to Nemo Ltd., also of Piraeus, with no change of name. In 1978, the vessel was broken up in Greece. Not an easy vessel to WWW search - the references are very few indeed. Can you add to and/or correct the above? A tanker. Per 1 (extensive detailed data, images, Tanea), 2 (data & 2 images, Tanea), 3 (Miramar, link, you now must be registered to access). 101.1 metres long overall, 331 ft. 10 in., 96.4 metres long perpendicular to perpendicular, speed of 10.75 or 11 knots, signal letters GNGU or ZMDA. Built, at a cost of �297,024, for the coastal trading requirements of 'Shell Company of New Zealand Ltd.', of Wellington, New Zealand ('NZ'). Launched by Mrs W. J. Jordan, wife of the New Zealand High Commissioner. Tanea? A genus of sea snail, in the family Naticidae. Per Miramar the vessel became owned, in 1960, by 'Shell Oil New Zealand Ltd.', also of Wellington. Felipes, also built in 1950 by Crown, was almost her identical sister. The vessel left Sunderland on Jul. 27, 1950 for Wellington (arrived there Oct. 22, 1950) via Suez & Singapore. The vessel was engaged for many years in the carriage of refined petroleum products around the coasts of NZ. But apparently only visited Auckland once, on Feb. 28, 1953, when said to have been owned by 'Shell International Shipping & Trading Co. Ltd.' Late in the day on Aug. 11, 1957, the vessel was stranded in the Wanganui River whilst sailing in ballast from Castlecliff Wharf, Wanganui, North Island. She was aground for only an hour & was re-floated after discharging 1,000 tons of water ballast. On Apl. 18, 1962, the vessel shuddered & stopped at sea when she was at the epicentre of an earthquake when 100 miles off Wellington. In 1964, with the opening of New Zealand Refining Company Limited's Marsden Point refinery at Whangarei, the vessel became too small for further service in NZ. After being briefly dry-docked at Wellington, she sailed from Wellington & from NZ on Apl. 02, 1964 for future service in the Singapore area. The vessel was, in 1964, transferred to 'Shell Tankers (U.K.) Ltd.', of London. 1 sets out in detail her subsequent service which included service in South Vietnamese waters, to the NW Australian ports of Port Hedland & Broome, & service as a 'lightening' tanker off South Vietnam. For more than a year she traded exclusively between Pulau Bukom, Singapore, & Woodlands, on Singapore Island. In the summer of 1967, the vessel was partially rebuilt at Jurong, Singapore ('Between July and September 1967 she underwent extensive steel renewals at Jurong drydock, Singapore'). In 1971, the vessel knocked down number seven jetty, in Pulau Bukom, Singapore. It took two weeks to repair the ship & probably much longer to fix the jetty! The vessel was laid up, in the Western Anchorage, at Singapore, on Jan. 20, 1972, & a few days later, on Jan. 31 or Feb. 2, 1972, the vessel arrived at the Jurong, Singapore, ship breaking facilities of 'National Iron & Steel Works', to be broken up, having been sold for about $30 per ton light displacement. Can you add to and/or correct the above? A tanker, later converted into a bulk carrier, with a most interesting history! Per 1 (Norwegian page, extensive data, Rondefjell, Google will not translate the page), Rondefjell), 2 (Norwegian page, data, images, Rondefjell), 3 (Miramar, link, you now must be registered to access). 183.9 metres long overall, 175.9 metres perpendicular to perpendicular, speed of 13 1/2 knots. Since Crown's slipways were not long enough (the ship was twice as long as their longest slipway), the vessel was constructed in 2 parts which were launched on Apl. 9, 1951 & on Oct. 15, 1951 respectively. Those 2 parts were towed to the Tyne & 'joined' & engines fitted at Middle Docks dry dock at South Shields, the 'joining' being completed in Dec. 1951. The vessel was nicknamed 'Half-Crown', a British coin that the webmaster well remembers but is now surely long extinct. The first major tanker to be built in this way, I read, but many other ships were later so constructed. I have read that the vessel was 5 times bigger than any vessel previously constructed at 'Crown'. Built for 'A/S Falkefjell', of Oslo, Norway, at a cost of NOK 20,356,000, Olsen & Ugelstad the managers. Her maiden voyage was to Cape Town, South Africa. While I have read limited detail, in Jul. 1960, the vessel was in collision with Pekin, a Russian tanker, off Bizeta, Tunisia. Rondefjell 'sustained severe damage to her No. 8 wing tank and sun deck and her engine-room was flooded'. She requested tug assistance & was towed into Bizerta. Pekin was held responsible, I read. While repairs were being effected, the vessel was converted to burn heavy fuel. In 1962, the vessel ran aground & caught fire - have not read exactly where put possibly in the Scheldt river. Also in 1962, the vessel was converted into a bulk carrier by T. W. Greenwell & Co. Ltd., of Sunderland, with the assistance of Thos. Young & Sons (Shipbreakers) Ltd., also of Sunderland, who cut out the old cargo section - the vessel was lengthened to 202.4 metres overall, (190.7 metres between perpendiculars), (664.2 ft. & 625.8 ft. respectively) & became of 19006 gross tons. In 1968, the vessel was sold, for U.S. $1,400,000, to 'Ultramar Armadora SA', of Piraeus, Greece, & renamed Nestor. In 1972, the vessel was sold to 'Nav. Mar. Fluvial SA', of Callao, Peru, & renamed Capirona. A year later, in 1973, the vessel was sold again, to 'Linea Oceanica Peruana SA', also of Callao, with no change of vessel name. On Dec. 6, 1980, the vessel 'sprang a leak', at 26.50N/168.30W, near Midway Islands, while en route from Callao to Japan. The above words sound modest but the 'leak' must have been a major 'leak' because the vessel was abandoned. On Jan. 6, 1981, the vessel arrived under tow at Honolulu, Hawaii, where it was laid up & probably not repaired. Since on Mar. 24, 1982, the vessel arrived at the Kaohsiung, Taiwan, ship breaking facilities of Shyeh Sheng Huat Steel & Iron Works Co. Ltd., to be broken up. Much of the above came from Google Books data 'snippets'. Can you add to and/or correct the above interesting history? A cargo ship. Per 1 (data & 1960 image), 2 & 3 (images), 4 (data & 2 images in Norwegian), 5 (Miramar, link, you now must be registered to access). 78.8 metres long perpendicular to perpendicular, 258 ft. 7 in., speed of 12 knots, signal letters LAOP. Built for A/S Luksefjell, 'Fjell Line', (Olsen & Uglestad, managers) of Oslo, Norway. The vessel was lengthened in 1960 (where I wonder?) for the joint Fjell-Oranje Lines European Great Lakes service, & became 90.6 metres (297 ft. 2 in.) long & 1887/8 gross tons. The vessel was sold in 1966 to Kala Shipping Co. S.A., of Piraeus, Greece, Grecomar Shipping Agency the managers, & renamed Lenko. On Sep. 11, 1968, while en route from Assab (Eritrea, W. coast of Red Sea) to Rotterdam with a cargo of 'bagged seed expellers' (whatever exactly that means. 'Expelling' involves mechanically pressing raw materials, seeds in this case, to extract the oil content), the vessel caught fire at Mocanbique (means Mozambique?) & was lost. Length & tonnage data conflicts to some degree. Can you add to or correct the above? A cargo ship. Per 1 (Albyn Line, image Thistledhu), 2 (image Riodoro), 3 (Miramar, link, you now must be registered to access). 137.1 metres (420 ft.) long perpendicular to perpendicular, 449 ft. 11 in. long overall, speed of 13 1/2 (or 14) knots, signal letters MVYX. Built for Albyn Line Ltd. ('Albyn'), of Sunderland, Allan Black & Co., the managers. The word 'dhu' means 'black', I learn. From 1957 to 1960, the vessel was chartered to 'Avenue Shipping Co. Ltd.' & for the duration of the charter the vessel was named Kildare. Visited Auckland, New Zealand twice as Kildare in late 1959. Was renamed Thistledhu in 1960, when the vessel reverted to Albyn. Was then chartered to Nigerian National Line. In 1966, the vessel was sold to 'Somerston Shipping Co. Ltd.', Chapman & Willan the managers, & in 1967 renamed Merton. In 1968 the vessel was sold for the last time, for �350,000, to 'Anesis Shipping Co. S.A.', of Greece, 'Glyptis & Scarvelis' the managers, & renamed Rio Doro. 3 indicates the vessel was clearly named 'Riodoro', i.e. all one word, on its bow in 1969 (see the image full screen). Litigation involving Nigeria refers to Rio Doro. The vessel was sold, it would appear, to Pakistan ship breakers, & was en route (when?) from Fredericia, Denmark, to Karachi, Pakistan, with a cargo of phosphates. On Nov. 5, 1977, the vessel was stranded - at 55.52.48N/10.49.30E which is off the E. coast of mainland Denmark. On Jan. 16, 1978, the vessel arrived at the Bilbao, Spain, facilities of 'Revalorization de Materiales S.A.', to be broken up. Much of my data is from incomplete 'snippets' of information. The later data may all be related. Is it so? If so, the vessel, likely damaged in the grounding, made its own way or was towed to Spain? WWW data is limited. Can you help with more data? The 'Crown' yard was acquired by Joseph L. Thompson & Sons Ltd. in 1946. But the yard was for about 10 years thereafter run as an independent shipyard. Only in 1956 were vessels constructed at the yard considered to be 'Joseph L. Thompson' vessels. So .... vessels built thru 1956 are listed above as 'Crown' vessels. While vessels built in 1956 & later, vessels that are considered to be 'Joseph L. Thompson' vessels, are listed as 'Thompson' ships here. 239 vessels built before that change. And 10 after it. I have added this 'short-lived' shipbuilder into these pages having noted three ships that they built in 1874. Those ships were named Imperatritsa Ekaterina II, Warrior & Westella. But in total they built 12 ships, the earliest being launched in Mar. 1872 & the last in Jan. 1875. It is clear that on Jul. 21, 1873, John Davison & William H. (Henry) Stokoe entered into a 14 year lease arrangement with Joseph Moore & William Henry Moore for a site at Southwick at which to build ships. At a rent of �50 per annum. John Davison apparently died in Jan. 1875. On Sep. 21, 1875, Stokoe filed a liquidation petition. All of this per a report in 'The Weekly Reporter' Vol XXIX, of Jun. 3, 1876, which report you can read here ex here. It would appear that the reversion rights to the property were owned by Ayres Quay Bottle Company. So Davison & Stokoe were in business for only a short time. About 3 years. It would seem that he had a shipbuilding yard on the south bank of River Wear & east of the road bridge. Further that his site had previously been owned by William Pearson & was taken over by S. P. Austin and Son as it expanded after 1870. Miramar (you now must be registered to access) refers to two Sunderland shipbuilder names i.e. 'Denniston & Pearson' & 'John Denniston'. Miramar list (highest number on page). It used to be that you could click on the link that follows & get to the relevant Miramar page. But no longer! The new procedure must be to go to Miramar (here) & log in (you must be registered to view any page). And once you are logged in, return to this page & the following link should work for you:- No numbers. But that is all that I 'know' today. A barque. Per 1 (Hebe 1868), 2 (Hebe loss ref. 90% down). 115.0 ft. long, signal letters PWBS. The webmaster has a few editions of Lloyd's Registers available to him, ex Google Books, see left. It would seem that for many years, at least thru 1874/75, 'T. (Thomas) White', maybe of & certainly registered at South Shields, was the owner & likely he was the initial owner. The vessel would seem to have served both the Mediterranean & the Baltic. The next available register after that of 1874/75 is re 1878/79 where the owner is recorded as 'J. Bambrough' also with a reference to South Shields. Which surely, in fact was, James Bambrough ('Bambrough'), in 1880 & in 1884 of Alice Street, Sunderland. The 1883/84 edition of the register indicates 'J. Bambrough' to be the owner but that the vessel had been lost. Re that loss, I read that the vessel, captained by Henry Webberling, foundered in the Bay of Biscay in Apl. 1883. The Court of Inquiry report re the loss of Constance, in which report reference to the loss of Hebe is found, makes interesting reading. It would seem that Bambrough had been a ship owner for 16 years & in those years had had only 5 ships, all of which had foundered. Clearly the Court was uncomfortable with the history & suspected insurance fraud. Webberling & Samuel Kent, his mate, 'may be said to have had considerable experience in the foundering of vessels.' And re Bambrough? 'he has had the misfortune, or, shall we call it, the good fortune to lose all his five vessels in succession one after the other, the three last within the last 3 or 4 years, and all three by foundering.' Is it possible that you can provide more data? For your pleasure and amusement. Most folks like donkeys. A 'Raphael Tuck & Sons' Oilette postcard #9494. 'A Ripping Time'. Mailed at Sunderland in 1909. An eBay image, cleaned up a little for better presentation on this page. Strangely, the second postcard image, later added below, also seems to be similarly entitled i.e. 'A Ripping Time', Oilette postcard #9494. How can that be, I wonder. Both part of a series? There must have been a series of cards, maybe a set under that 9494 number. I have since seen a couple of additional variations on the theme. It would seem that the postcards date from about 1908/1909 thru to about 1915 or 1916. That is just what I have observed - I am not an expert on the subject! There is another postcard image of donkeys on Roker beach here. And a few more images that may well please you. They certainly please the webmaster. None of them relate to the Sunderland area, of course.